Stick Horse Rodeo . 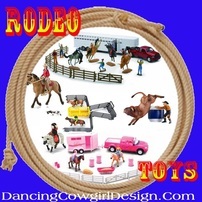 Fun ideas and useful information, photos and videos describing rodeo events that can be played with a stick horse. 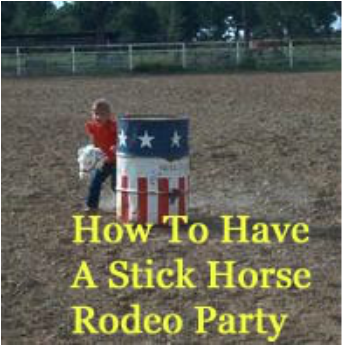 Have a Stick Horse Rodeo, a party, western style event or for some backyard fun. A stick horse rodeo is a lot of fun for kids and adults. I know that because I had one. When my grandkids were younger, I always planned my birthday party around something they they would have the most fun at. As it turned out, they had been participating in a weekly stick horse rodeo at an arena near us so I was able to borrow the arena for the party. As I mentioned, adults have a great time on a stick horse also. This is a video from my party where my mother is running barrels on her homemade stick horse. She made it from a dust mop and used a toilet brush for her whip. All of the kids, parents and grandparents participated so we had different age categories set up for each event. Rodeo secretary - someone to make a list of each person competing in each event and write down the times or scores in order to keep track of that and determine the winners. Time judge - someone to operate the stopwatch at the start /finish line and announce the time. Clipboard or notebook with paper to sign up the contestants and write down the times. Contestant back numbers (optional) See my rodeo party page for examples of back numbers. At the bottom of this page you will find some special mutton bustin' party supplies that I have designed. At this party, we had barrel racing in three different configurations. The first is a clover leaf pattern run around three barrels. This is the Barrel Racing Pattern used in Rodeos, Horse Shows, Playdays, and Stick Horse Rodeos. 55 Gallon drums are used for barrels, but for fun you can use just about anything from traffic cones to grandmaws pots. So no matter what type of Horseportation you have, learn from this pattern. The kids have their own competitions around the house for fun on horses, stick horses or on foot. This event also uses three barrels but they are set up in a straight line. You can start from either side to complete this weave. Weave past the first two barrels, turn at the last one and weave back through to the finish line. This is a single barrel speed race with one turn. You can make the start/finish line as close or as far as you want from the barrel. This is the pattern that you saw in the video of my mother from above. A couple of other fun ways to use this one barrel pattern are flag or potato races and rescue races. For a flag race, sit a bucket full of dirt on top of the barrel and push a flag or ribbon down in it enough to hold it. Make the same run around the barrel and bring the flag back to the finish line. For a potato race, sit a potato on top of the bucket of dirt. When returning to the finish line, throw the potato in a garbage can as you go by. The flags or potatoes could also be substituted with a stuffed animal cow and call it a cattle penning event. The Rescue Race is a team event where the rider runs to the end where a barrel is set up and the jumper is waiting. 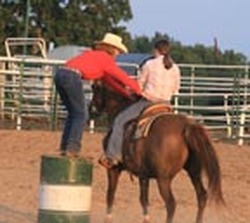 Normally the jumper, the person being picked up, will either stand behind the barrel and swing up on to the horse or stand on the barrel and jump on from there. The rider on the horse has to complete the turn around the barrel. Then they head back to the finish line. This will work similarly with stick horses. The jumper will stand behind the barrel and wait for their partner to pick them up. They will both make the trip back to the finish line on the same stick horse. Pole Bending is run through 6 poles that are normally 21 feet apart and the first pole being set 21 feet from the starting line. We kept it this way at my party since we had the room and the poles. You can reduce the space between the poles to suit your space and since the regulation pattern is for horses, you don't need that much anyway. Generally a pole bending pattern requires a run to the last pole before making the first turn. Then weave through the poles to the end, turn and weave back up the pattern and make the turn around the last pole and straight back to the finish line. See the little barrel in this picture. It is what they used at a stick horse rodeo my grandkids were in. It was much smaller than a regular 55 gallon barrel. If you don't have access to regular size barrels, poles, or even a roping dummy that is not a problem. Substitute those things with traffic cones, 5 gallon buckets from the hardware store or even coffee cans. Use whatever you have that your guest can run around or rope. 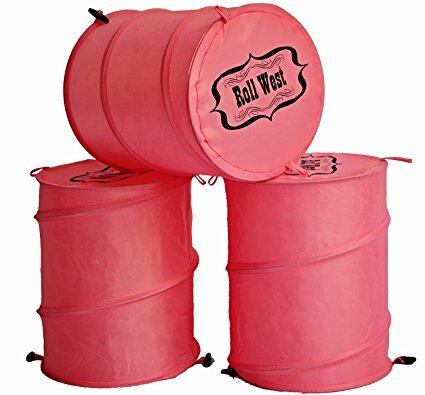 You can get these 22 inch tall and 18 inch diameter barrels that collapse down for easy storage or transport. They have the look of real rodeo barrels with the Wrangler NFR and PRCA logos. The bouncy horse shown in the picture does not come with the barrels, but I wanted to show that for an idea of the size. The main thing you will need for the party is a stick horse for everyone to use for their events. They can be store bought or homemade. If you decide to have stick bull riding, there is a cute stick horse bull available or just use the horse. The stick bull could also be used for roping if you push the stick into the ground or down into a bucket of dirt so it will stand up on its own. Set up a calf dummy and let everyone take their turn at roping. My advice is to mark a line to rope from so that each person ropes from the same distance. Consider making the line closer for the youngest kids and a few step farther back for the older ones. 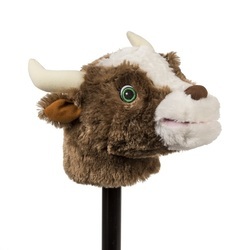 You can get calf and steer head dummies like the one in this picture. I have a page all about roping dummies. Ordinarily, roping is a timed event, but at my party, we came to a winner by elimination. Each person got 3 chances to catch the calf when it was their turn. If they caught it, they came back to the second round with others who had caught the calf on their turn. We repeated the next round with only having 2 chances to catch and move to the next round. For the last round they only one chance to throw their rope and catch or they were out until we determined the winner. At the event in this video they are using hula hoops as a rope for their calf roping and you will see that they have a different type of dummy. Either way is fine, actually any way is fine. You can use a bucket,a bale of hay or push a stick into the ground to serve as something to catch with a rope. It just depends on what you have available to work with. Stick horse bull riding is fun too but you will have to elect some judges to give the kids a score. Since they are acting as the bull and the cowboy it is quite a hoot to watch also. Have a look at this video of an event where they had stick horse bull riding to get an idea. For a party at home, you could use a big piece of cardboard to make a gate. Have the kids stand behind it and get ready to ride. When they nod their head, open the gate and let 'em buck. Time the ride for 8 seconds and blow a whistle to signal to them it is the end of the ride. Have the judges add their scores together and announce the average score. The score is on a scale of 100 points from each judge. There are a couple of kid size bucking chutes available now and these would work as well with stick horses or stick bulls as they do with the bouncy horse and bull in the pictures. This is a picture of my niece with her winnings from a stick horse rodeo one day. This was an event where we paid an entry fee to participate in each event so they had funds to give lots of ribbons and trophies. At my party, I made homemade award ribbons from ribbon I bought at the craft store and attached a sticker to them. This example is similar to the ribbons I made. I printed the top part on a blank shipping label and stapled the different colored ribbons to it. You could also print the top on an index card or other strong card stock paper. The top card was about 3x3 inches and I used a 2 inch ribbon. I cut a V shaped notch at the bottom of the ribbon so it looked more like a standard award ribbon. You can leave it straight of course. I made a different version for each event and had enough for each age group. I had ribbons for 1st thru 6th place in each event and each age group so just about everyone won a ribbon of some sort. Here is the color code I used for the ribbons which is the same as I have on my ribbons from horse shows etc. Regular award ribbons are available for purchase also. This set comes with 36 ribbons, but only has 1st, 2nd and 3rd place ribbons included. They measure 6 1/2" x 1 3/4". These little trophies are very inexpensive and will work good for party prizes. You could print stickers to attach to them if you want to make them more memorable. Here is an example of a sticker that you could make to add to a trophy. Adults have just as much fun with this so make sure to get them in on the action. You can do this indoors or outdoors and depending on the space allowed, make larger or smaller patterns to go around. The following videos show an indoor event, a get together in the yard and a large community event as examples of how versatile and how fun this can be. 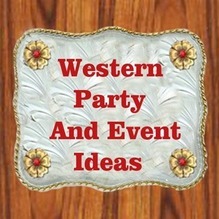 Below the videos there are other related pages for more western party themes. 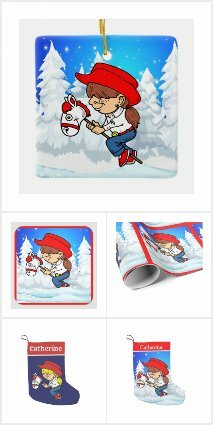 Below are examples of party invitations, paper plates, napkins, stickers, t-shirts and gift wrapping paper for a stick horse party. 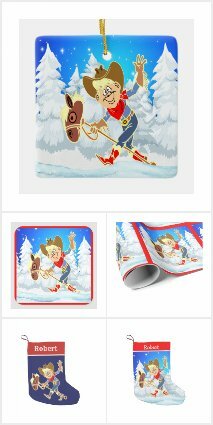 You can see these and other cute western party supplies in my Rodeo Days Store or go straight to the Stick Horse Collection. 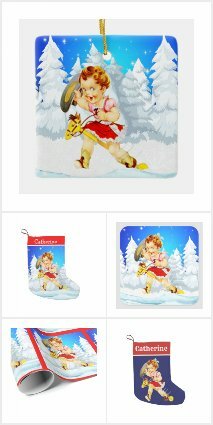 I have recently added some stick horse items with Christmas holiday themes including stockings, ornaments, stickers and gift wrapping paper.